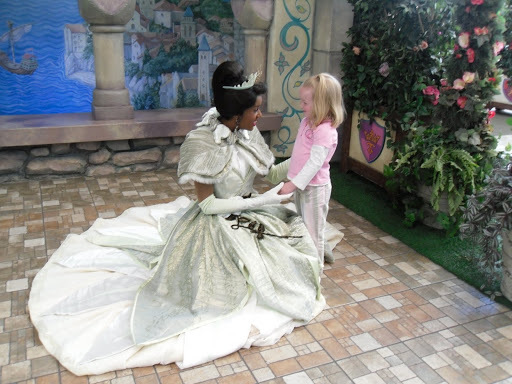 Day 4 started with me getting in the very, very long line for the princess meet and greet, Olivia hoped to meet Cinderella or Sleeping Beauty but we got Tiana and Belle, after waiting for an hour it was a little disappointing but the big kids and Rob were able to go on 6 rides while I stood there and chatted with the other moms. 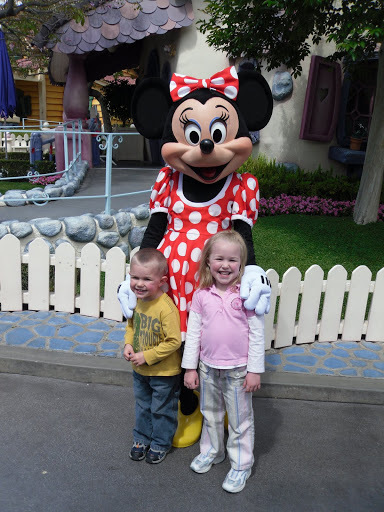 Then the boys met up with Olivia and I over in ToonTown. 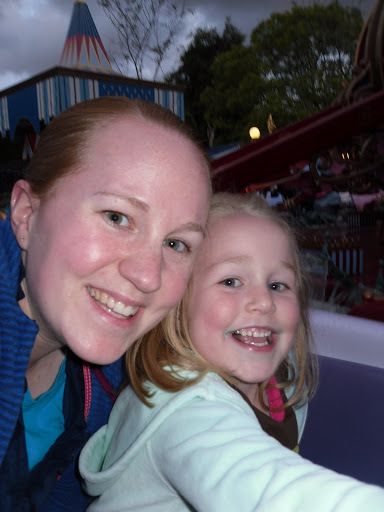 Olivia was super excited to ride in the front of the roller coaster all by herself, I was glad to not ride it at all! 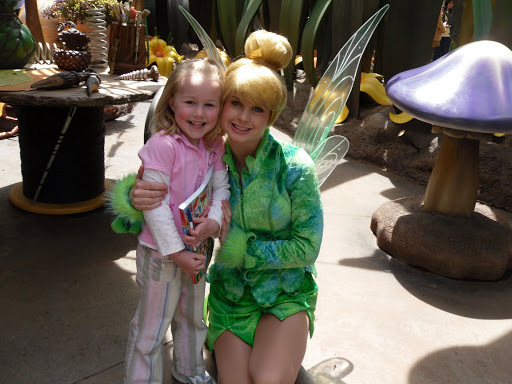 Then it was off to stand in the line to meet Tinkerbell and friends while Zachary and Rob did some more rides. 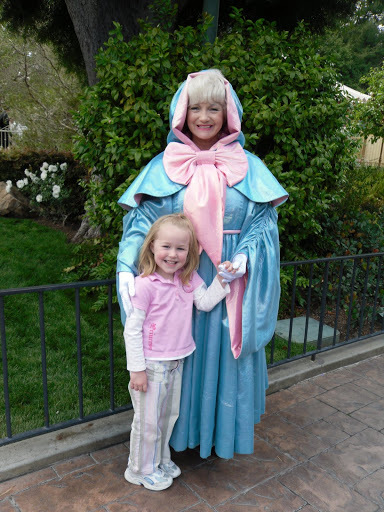 The we ran into the Fairy Godmother, who was Olivia’s favorite character when we went two years ago and it was the same lady again which was fun. She is just delightful! 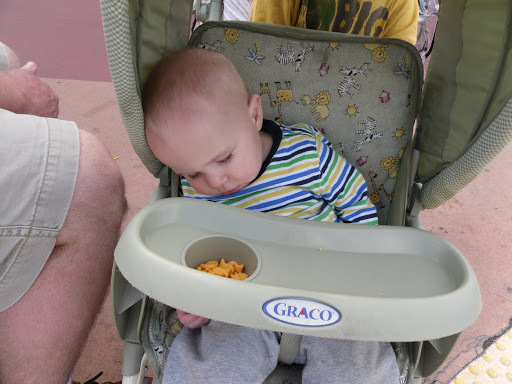 Zander finally fell asleep just before we were ready to head back for lunch and naps. Olivia and Rob did Tower of Terror while I waited with the boys for the parade to start, it got really windy and cold during the parade but that meant that after it was over we had Bugs Land almost to ourselves! 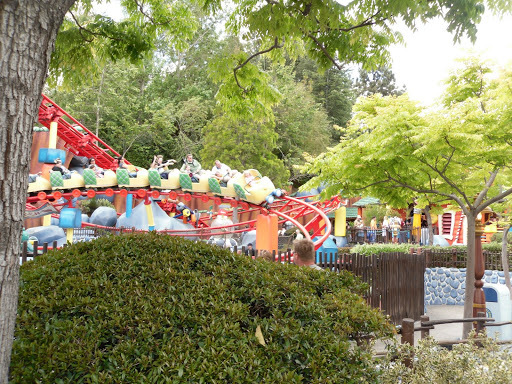 We also got to go on Toy Story Mania finally, it is definitely my favorite ride! 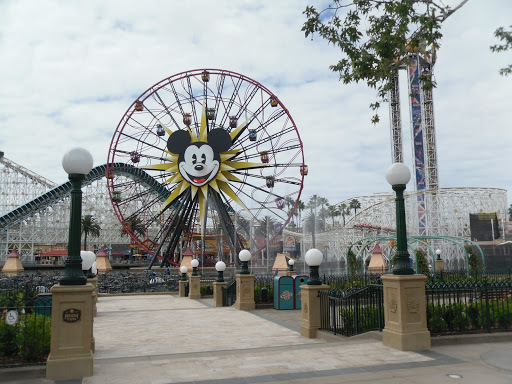 Day 3 we started off our day going to California Adventure hoping to ride Toy Story Mania but it wasn’t open that morning so we rode the big Sun Wheel after looking at the very, very cute baby ducks that were swimming in the water there. Olivia was TERRIFIED on the Sun Wheel and we even rode in the non moving car. Zachary thought it was great, I loved the view of the park and the fountains they were testing for the new show coming this summer. Then Rob and the big kids rode the carousel several times, we also got to meet Jessie and Woody. 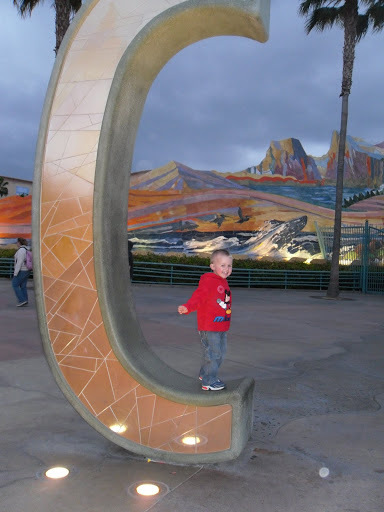 Then we walked over to get fast passes for Soarin over California and to take pictures with Lightening McQueen and Mater. Then we rode Monsters Inc and went to see Turtle Talk and all the fun things in that building. 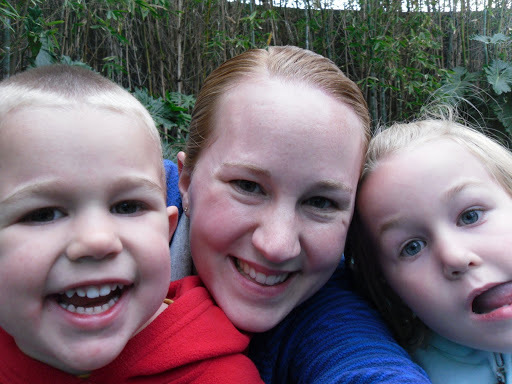 We then took pictures with Koda and Kenai and debated going on the river ride but since Olivia was only barely tall enough and it was a little cold we decided not to. Olivia and I rode Soarin, Olivia seems to really like the ride but she sure held on tightly to my hand during it! We then went back to the hotel for naps during which a huge storm came through Anaheim dropping a ton of rain. 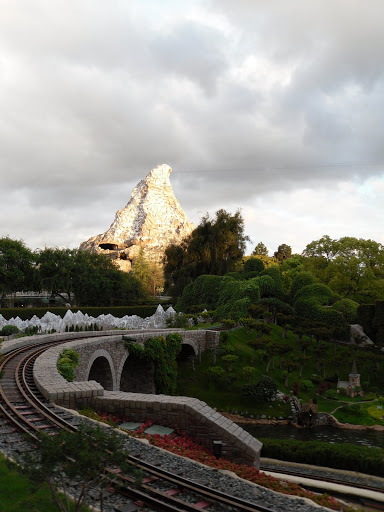 Rob and the big kids did the Haunted Mansion again while I waited outside with Zander, then Rob and Olivia did Big Thunder Mountain Railroad while I waited with the boys. Zachary had great fun trying to get a duck to come over to him. 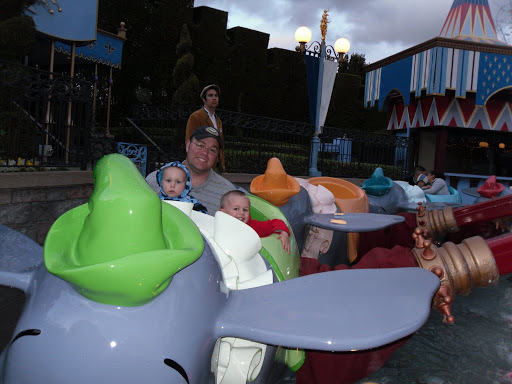 Then we did Casey Jr, Dumbo (which Zander also hated), and Peter Pan. We were glad that we had our rain cover for the stroller but it only briefly sprinkled while we were there that night, it was a lot cooler but the park was emptier because of that, too. On day two we left Primm to drive the rest of the way to Anaheim. 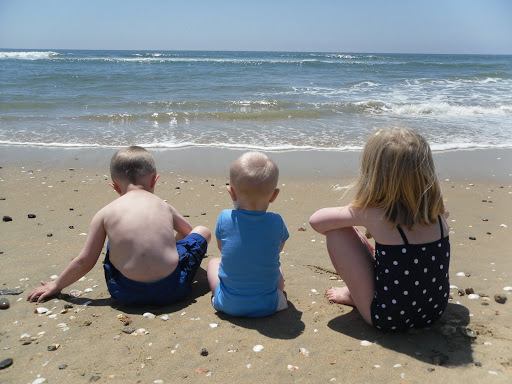 We decided to go straight to the beach since the weather was beautiful and it was too early to check into the hotel. The kids loved the beach and walking out on the pier to see the fishermen. 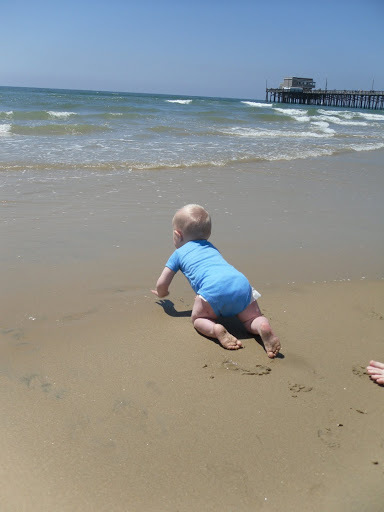 Alexander was little unsure of the sand at first but he quickly decided it was fun and was covered head to toe in sand by the time we left. 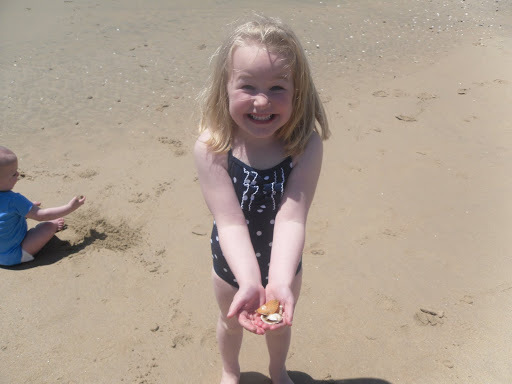 Olivia had a great time running in the waves and collecting shells. Zachary loved digging in the sand but he thought the water was much to cold to go in. 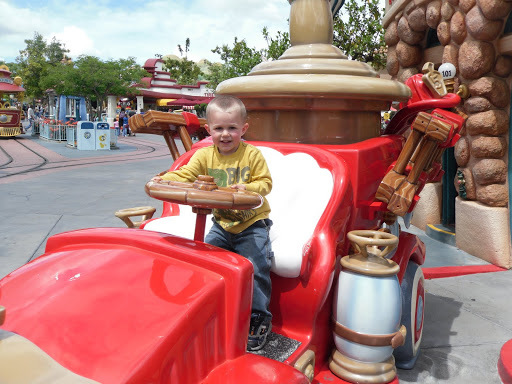 After we checked into the hotel and gave the kids quick baths to get rid of all the sand we walked over to Disneyland!! 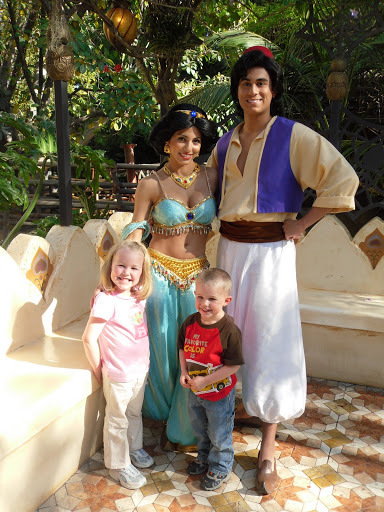 We rode Pirates(Zachy’s favorite ride), Haunted Mansion (Zander HATED it), Jungle Cruise, It’s a Small World, Buzz and met Jasmine and Aladdin. Then it was off to the grocery store and to dinner before we fell into bed exhausted. 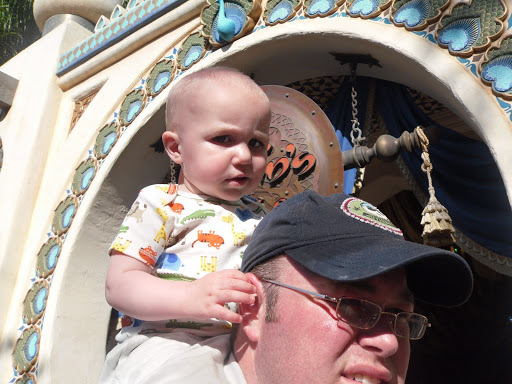 The face Zander is making is pretty much how he seemed to feel about the whole trip, kinda like what are we doing this for? We left for Primm, NV shortly after church on Sunday. The drive actually went pretty well this time. 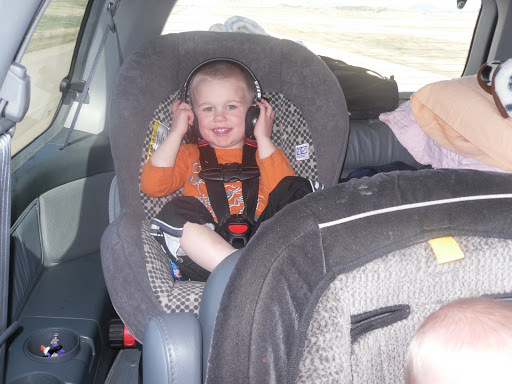 Zachary is still the best kid for road trips, he just chills in his seat watching shows and taking a nap with no fuss. 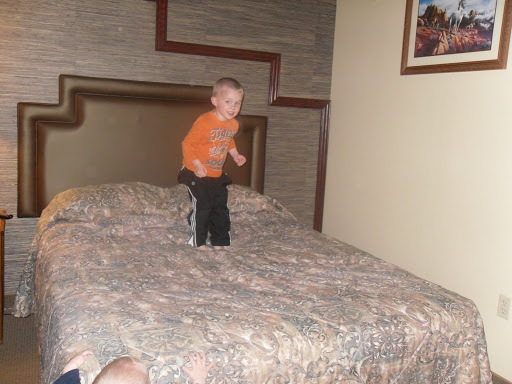 The kids really liked the interesting hotels you can see from the highway in Vegas, and after that long boring ride I can see why! We made it to the hotel about 8pm (and after listening to Zander cry from Vegas all the way there, we were all glad to get out of the van), the kids had a great time jumping on the bed and watching a new Disney movie on Daddy’s laptop. We thought we had booked a two room suite but it was really just one big room with a little divider wall between the TV room which had two chairs instead of a couch and the “bedroom”, so I was a little worried how we would all sleep in beds right next to each other but it went fine. The big kids were sharing a bed and in the middle of the night when I got up to make Zander a bottle I found Zachary using Olivia’s legs as a pillow, I really wanted to take a picture but I was afraid someone might wake up. 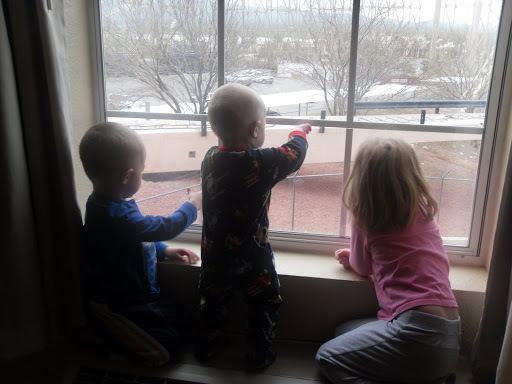 The hotel had a huge roller coaster that ran by our window and the kids really liked watching it (this picture is them actually watching for daddy who was taking a load of stuff out to the van before we checked out)! Another interesting thing that happened that morning was that Zander walked over to Rob holding a beer bottle, ummm that was so not ours… I guess housekeeping wasn’t to good at emptying the trash from the people before us. 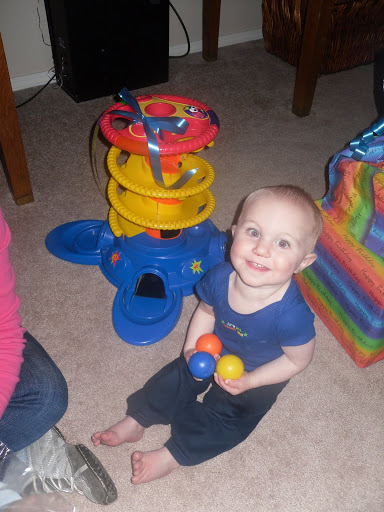 With the fun ball toy that Grandma and Grandpa brought him. 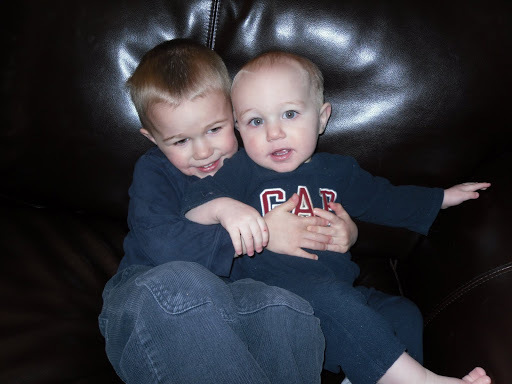 We sure love Alexander, he is a very sweet little boy and he LOVES me (which is good cause the other kids LOVE Rob). I think he is my prettiest baby (but he doesn’t take very good pictures, he gets that from Rob), he has the most lovely eyelashes and prettiest blueish eyes. 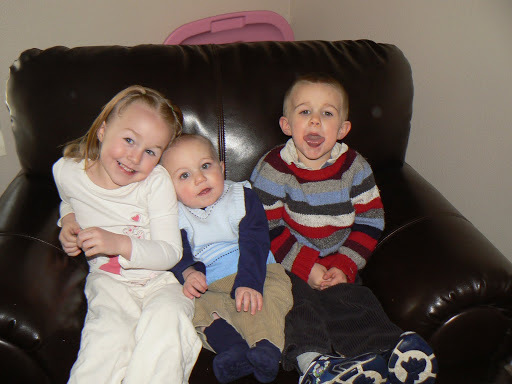 He adores Olivia and I can tell that he and Zachary are going to have all sorts of adventures as they get older. Alexander is more like me then the other kids, he is alot more shy and cautious then the other kids. 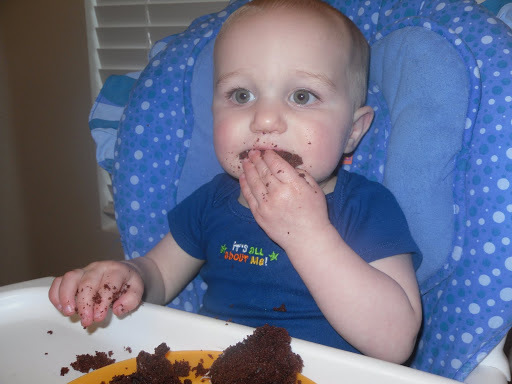 Its crazy to think that it has been a year since he surprised us by coming 10 days early and I don’t think it is fair that he was such a big baby but is now a small toddler. 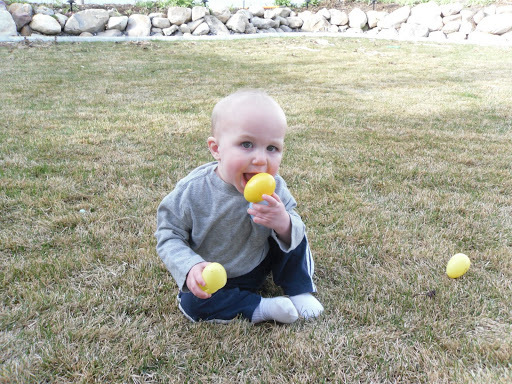 Alexander loves balls, carrying stuff around, formula, mommy and Olivia, and going outside. 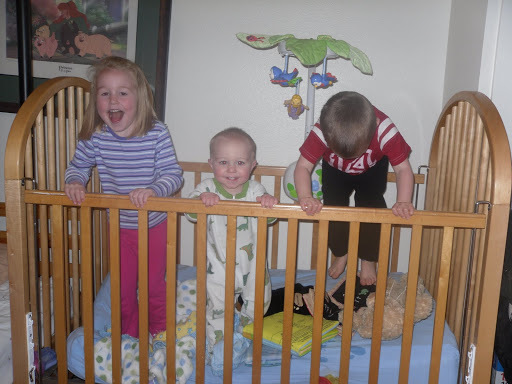 My little monkeys love jumpin in Zander’s crib. 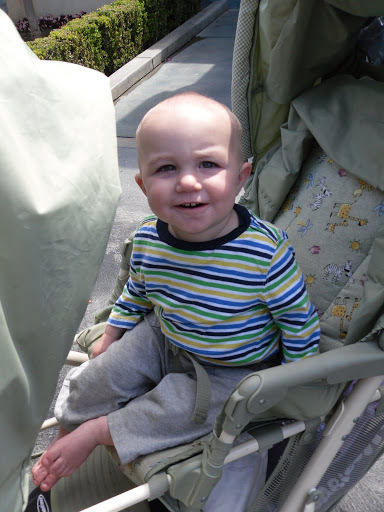 Alexander started walking on March 30th. 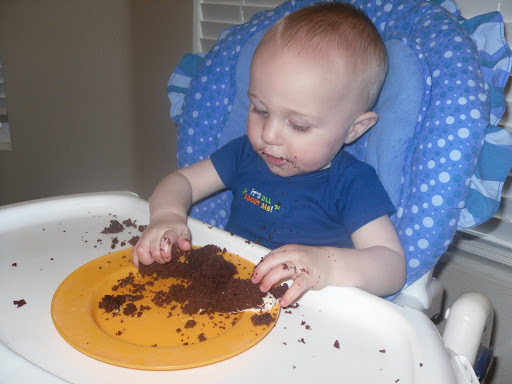 His first steps were taken from the open fridge door to the inside of the fridge, so I guess food motivates him! He is our first child who walked really cautiously, Lu was so old that when she finally started walking we figured she must have been studying how it worked because I don’t remember her ever crawling again and Zachary just ran everywhere from the time he was tiny, but Alexander would walk a little but still preferred to crawl. When he did walk though it was a super cute Frankensteinish walk with his arms all extended and mostly straight legs. 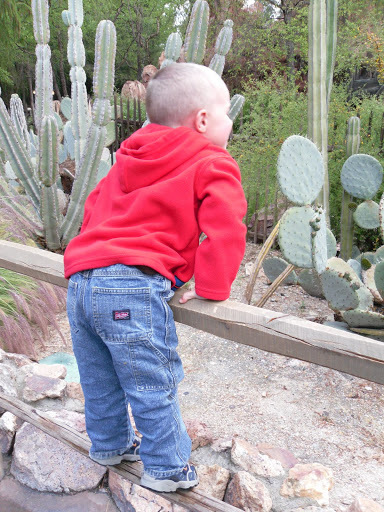 It was hard to get a picture since he loves the camera he would drop down and crawl over to me if he saw me try. 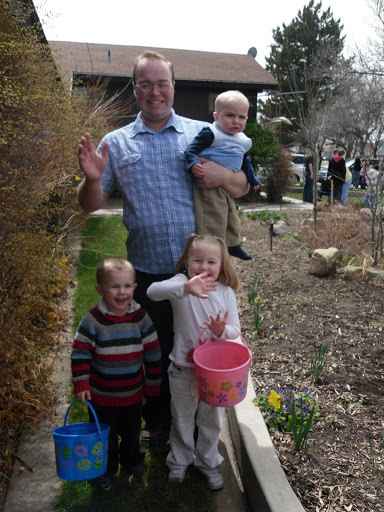 The family at Great-Grandma and Grandpa’s. 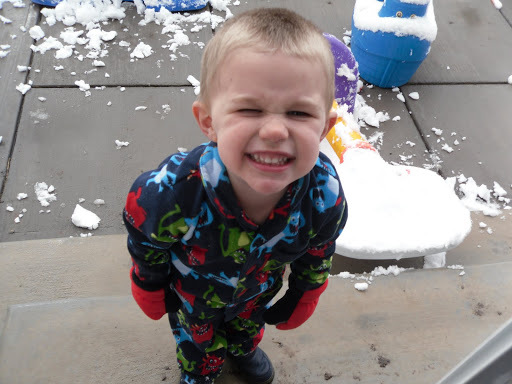 Zander during our backyard hunt. 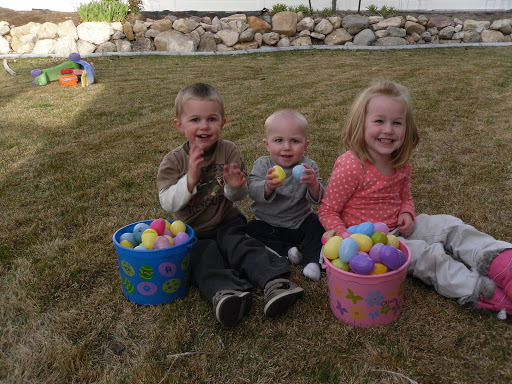 The kids after our backyard hunt. All dressed up to go to Great-Grandma and Grandpa’s house. Zachary has a new trick he loves to do when I get the camera near him. Boys! 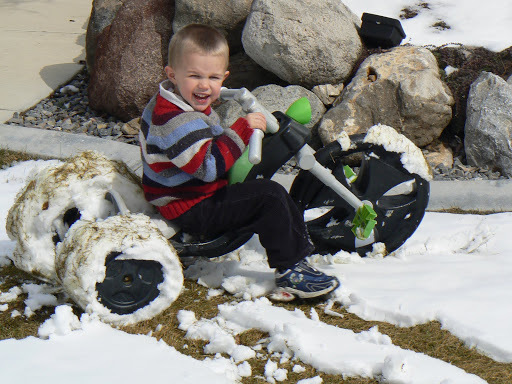 Riding the neighbors trike in our snowy front yard before we left. 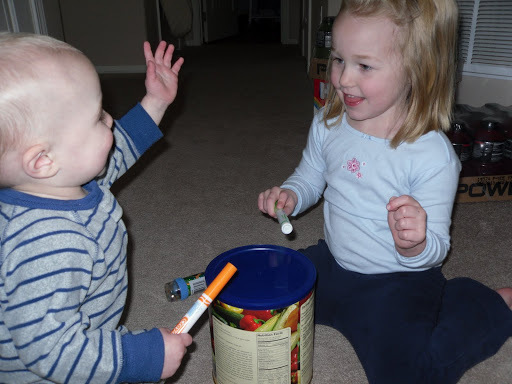 Olivia and Alexander had great fun playing drums on the food storage can. 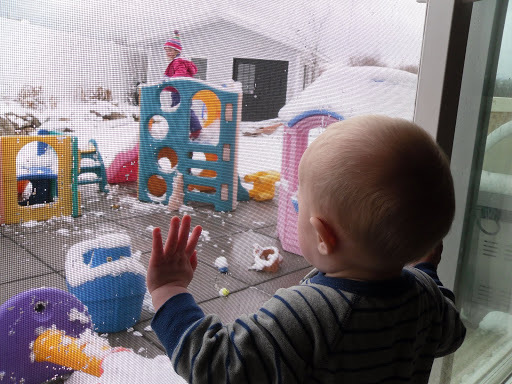 Zander really wanted to go outside, too. 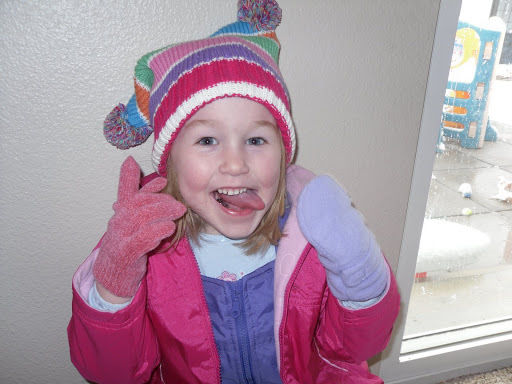 Silly Olivia, snow in early April makes the kids silly, it just makes me want spring to hurry up and come! !